Shag haircuts are modern and trendy, and every woman wants to try them out so as to keep up with the times. 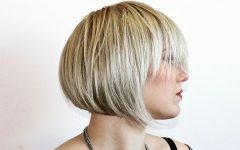 The basis of these haircuts is in most cases a bob or pixie cut, but you can have it in any other design, but you will need to style it inventively to create the shag texture. These haircuts are also very easy to design and in most case you only need to leave your strands to flow freely. Below is a gallery of 60 exquisite styles to help you find a style that will work for you. 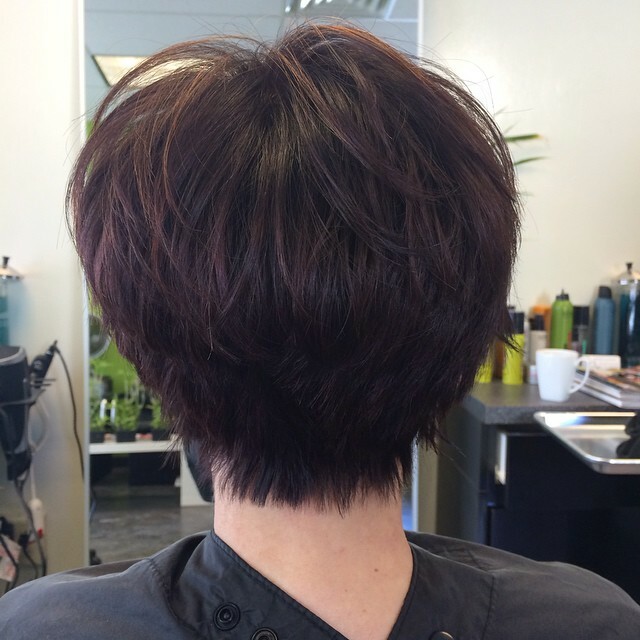 You can transform a pixie cut into anything that you wish, and you only need to vary the cut and styling. This particular one has a spiky cut with a tapered back, and you should style it by layering to create the shag look. The silver blonde tone is also marvelous, and it will give your design a perfect shade. This headdress takes inspiration from the 70’s, but it still looks great. 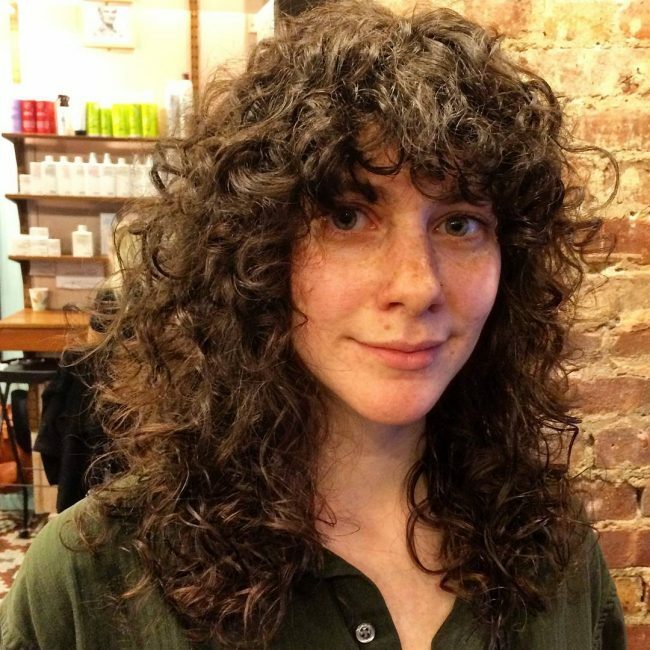 It has some long textured curls that only need a few modest cuts to give them this look. The styling is also important, but it is a simple face frame that you can create by sweeping the long curls to the side. The multiple hues in this design give the chin length wavy strands a fabulous tone. Apart from this the strands also have a decent volume, and you should style them by pushing them to the back and making them messy. 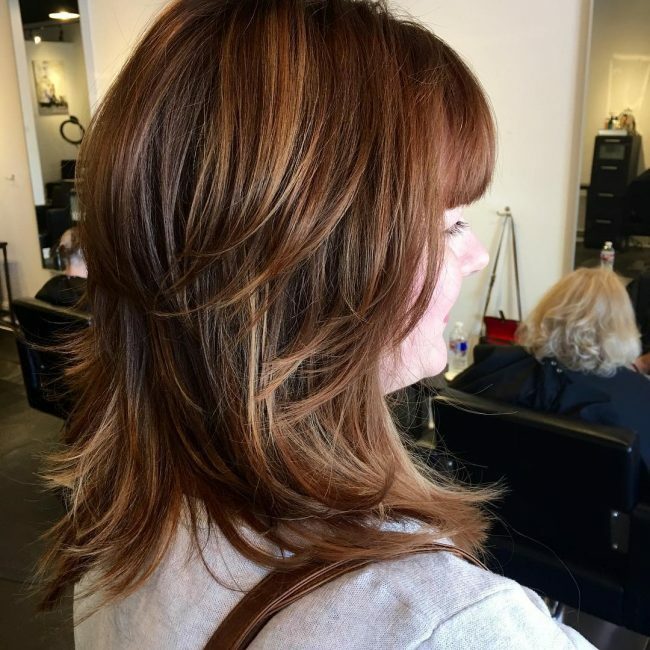 Although the cut and styling are the most important things in creating a shaggy hairdo the color is also vital if you want it to look unique. The long and layered rugged strands in this headdress have an amazing platinum blonde shade that gives them a top notch appearance. Their simple diagonal face frame is also excellent. 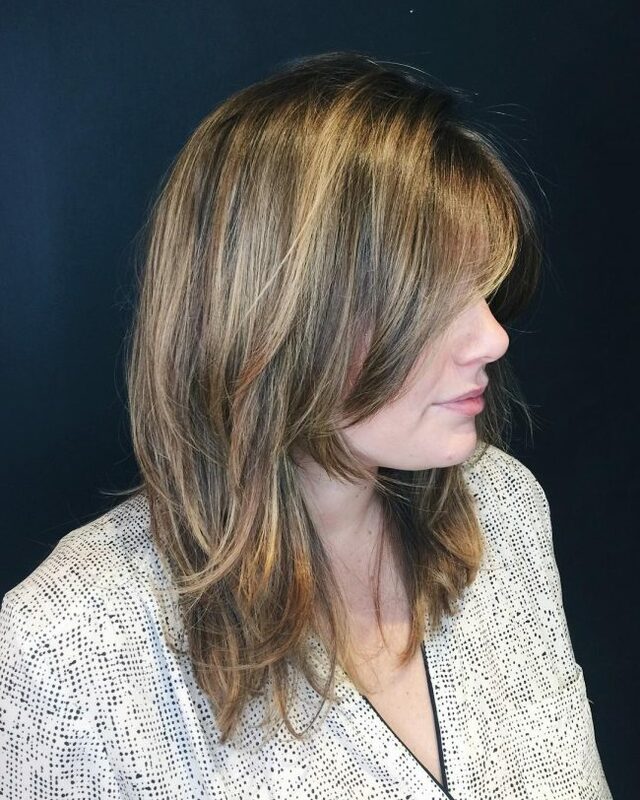 There is nothing else special about this style except the perfect cut because the color is a natural blonde. However, the haircut is enough to give the lady a great look. It involves chopping the strands to provide them with a thick texture and creating some long straight bangs with a blunt fringe. A little inventiveness can help you transform a simple bowl cut into something eye-catching like this hairdo. All you need is to grow out your bowl cut and then layer the locks and make them slightly messy to finish the style. If the strands are very long, you will also need to trim them to maintain a bowl shape at the front. These shoulder length locks may not have an excellent volume but their texture, styling and color compensate for this. 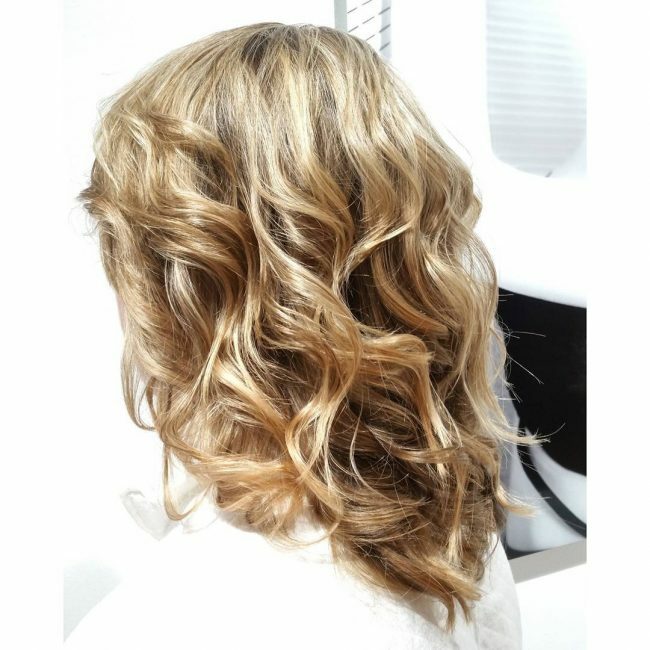 They have lovely golden blonde highlights, and you should style by pushing them back in stacks. However, you should do it with your hands to create the shaggy look. Modern hairdos try to do things differently so that the appearance can break away from the traditional looks. 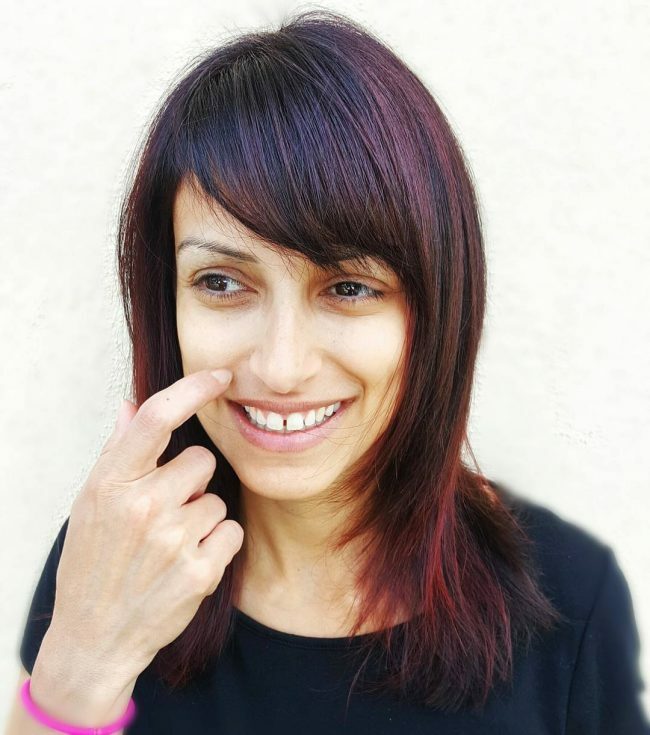 In this style, the long dark toned strands are chopped to create some blunt bangs at the front that you should then design into an arched fringe. You should leave the rest of the long locks flowing to the sides and back to finish the modern look. This headdress also draws inspiration from the 70's, but it has some elements of modern designs. 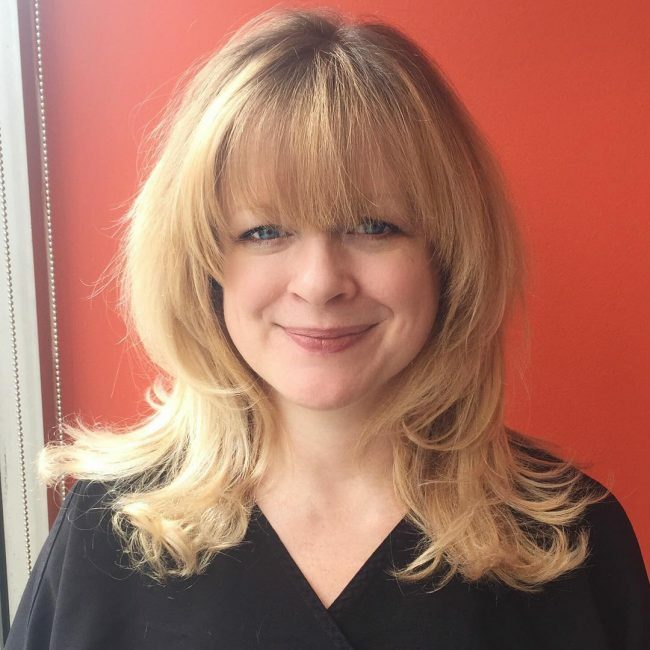 To replicate it you should trim your locks to create some textured bangs and also make the ones at the front into a thin fringe. 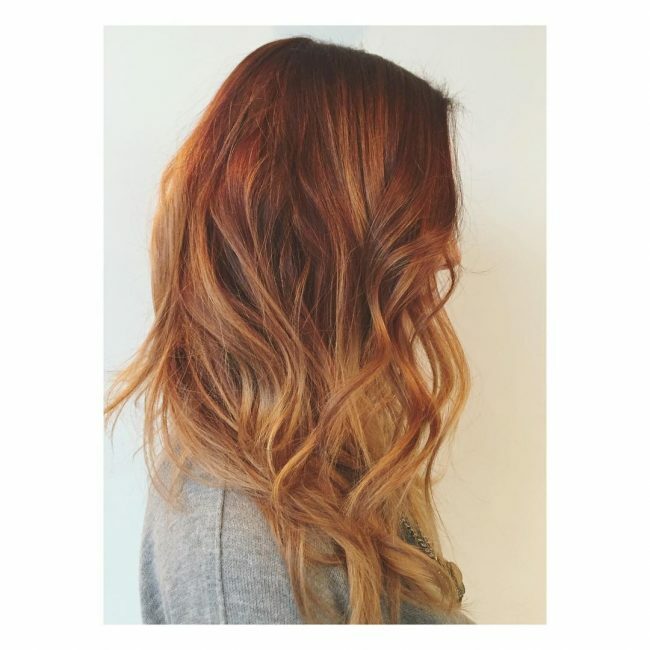 However, you should also have a blonde balayage dye job and style the locks by layering them. 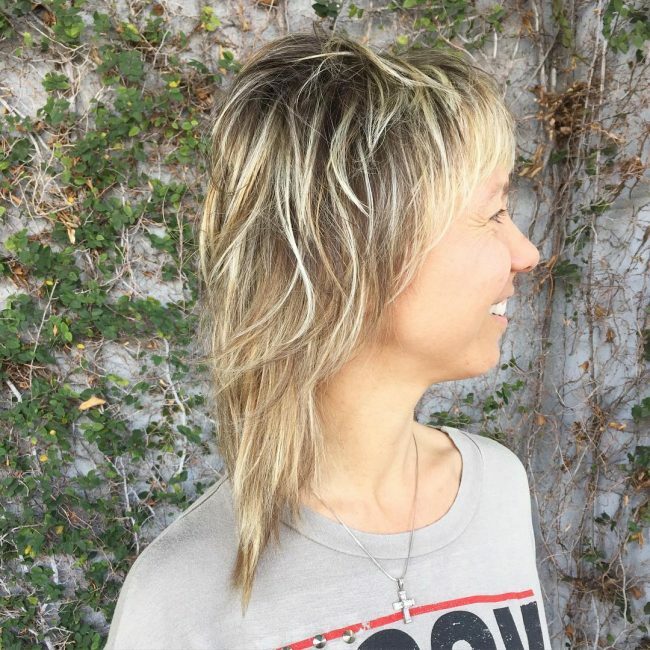 This style draws inspiration from a classic mullet, but it has a few things that make it distinct. These things include the dark tone and the fact that the strands also have some subtle spikes. To replicate this style you should have the front strands shorter than those at the back and style by making them messy. A redhead is easy to create, and you can use almost any shade of red, but the ideal one will depend on your base color and complexion. 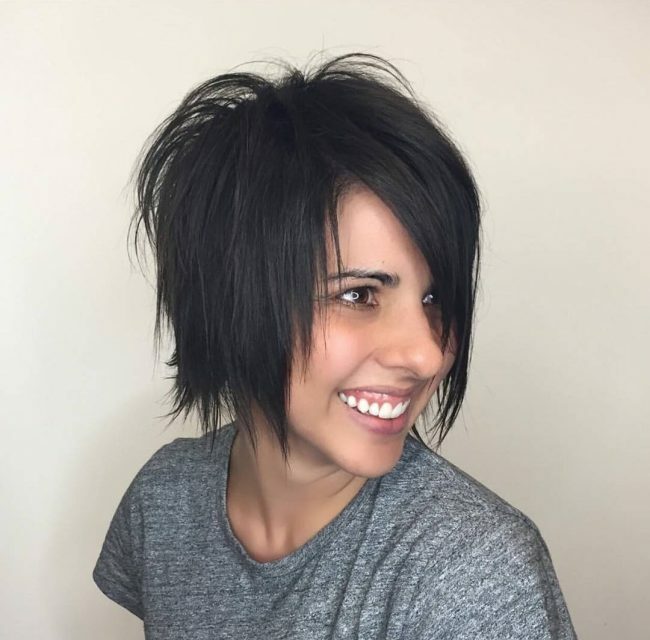 This style also has an edgy look that comes from some lovely scissor trims and a smooth brush back style that is slightly shaggy. Some shades like beige blonde look magnificent on ladies with light skin tones, but any other woman can still create a lovely style with it. 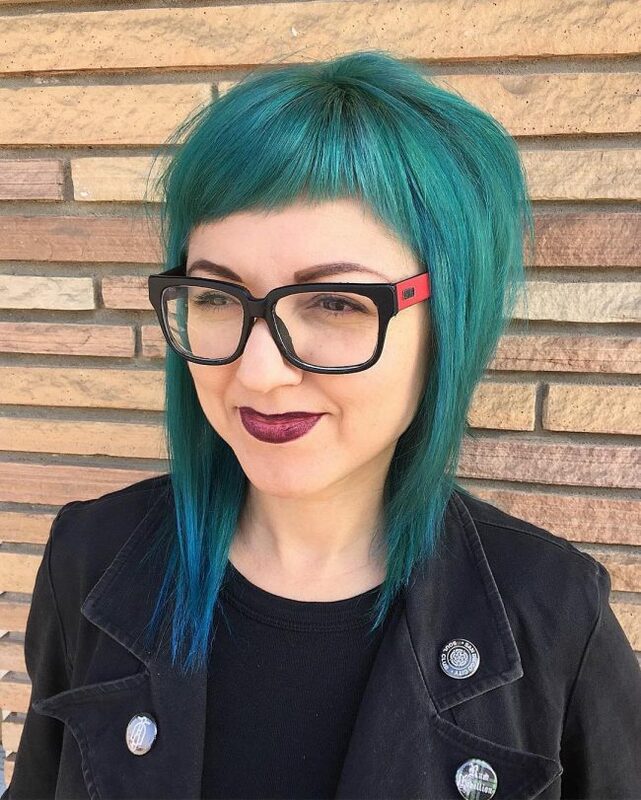 In this design, the shade accentuates a modern shag that comes from chopping and developing the medium length strands into a face frame pattern. A Bob may be a short haircut, but it looks good on any woman. In this style, it has some lovely pastel shades that brighten it. However, the messy appearance that comes from layering the locks is what makes it stand out. The versatility of pixie is one of the reasons why it is a favorite style for many ladies. 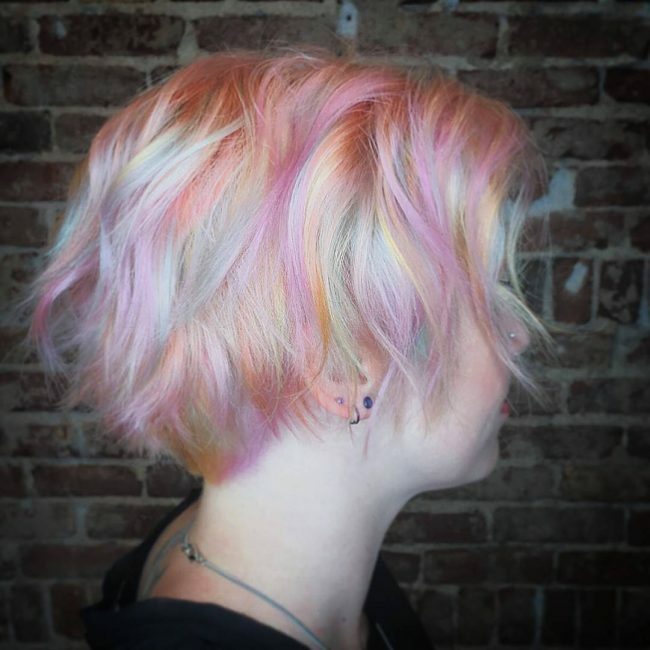 Here it helps to create a multidimensional look using a few pastel colors with pink and blonde being the most dominant. You should also make it shaggy for an extra dimension and to give it a modern look. Any lady who wants to keep short hairs should go for a bob as it is easy to create. It also looks very elegant if you cut and style it right like this wispy one. 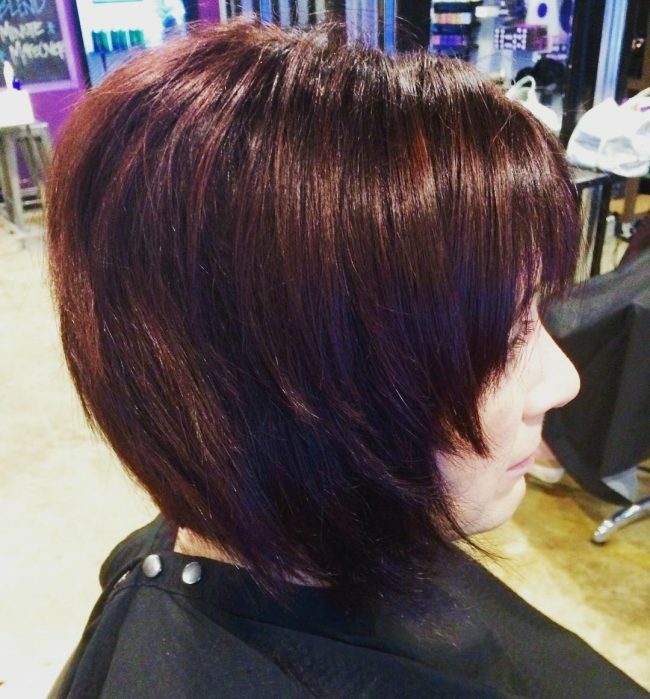 This one is a typical bob cut with a chocolate brown tone but the styling that involves stacking it is what makes it look outstanding. These bangs are perfectly cut and styled to create a contemporary headdress. They also have an arched fringe that is extended almost to the eye level. The styling is very simple, and it only involves making the bangs messy and pushing them back. The chocolate shade in this design also has some partial raspberry partial streaks that add some flavor to the style. However, the styling is still what makes it a top notch headdress and it involves sectioning and layering the straight locks to the sides. A summer hairstyle should be simple and require minimal maintenance like this one. 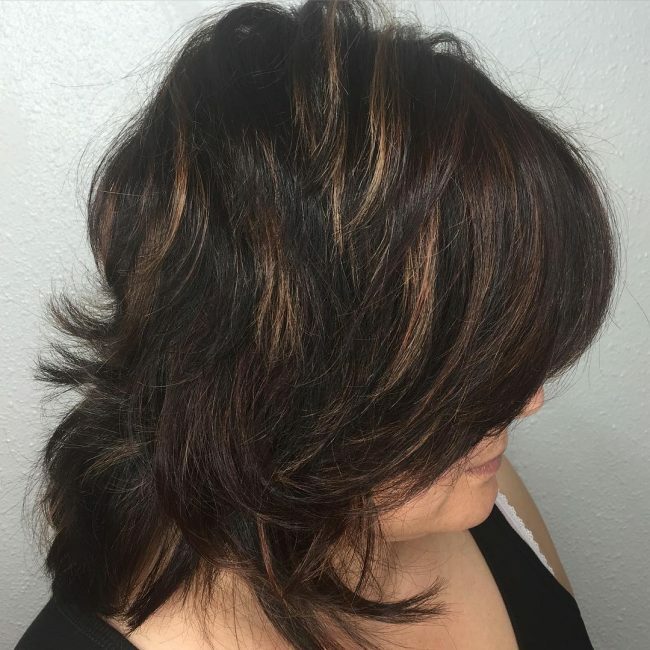 It has a vibrant dark brown tone with some hand painted blonde streaks and an eye-catching textured cut and shaggy styling. The fringe in this style is what will draw the attention of most people because apart from the shine it also has an appealing natural look. Apart from the fringe the shoulder length strands also have a perfect texture and a trendy and messy push back. 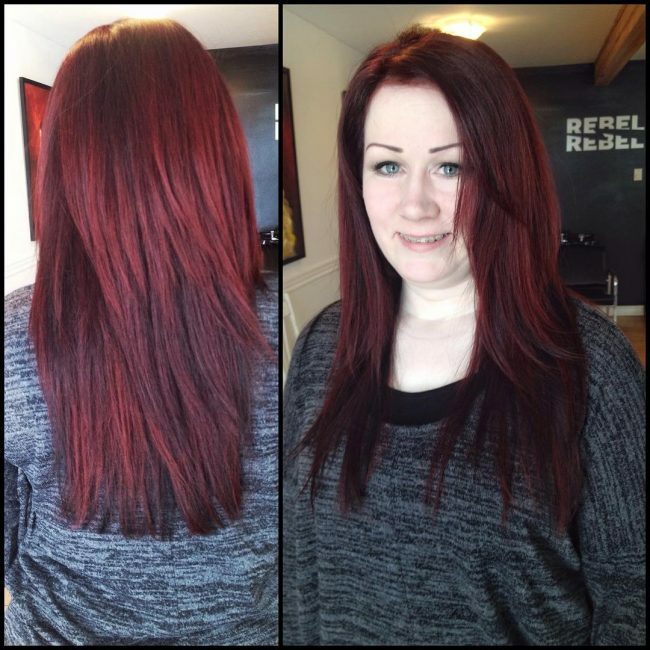 Sombre gives you the opportunity to transition from one shade to the other smoothly to create a fabulous. 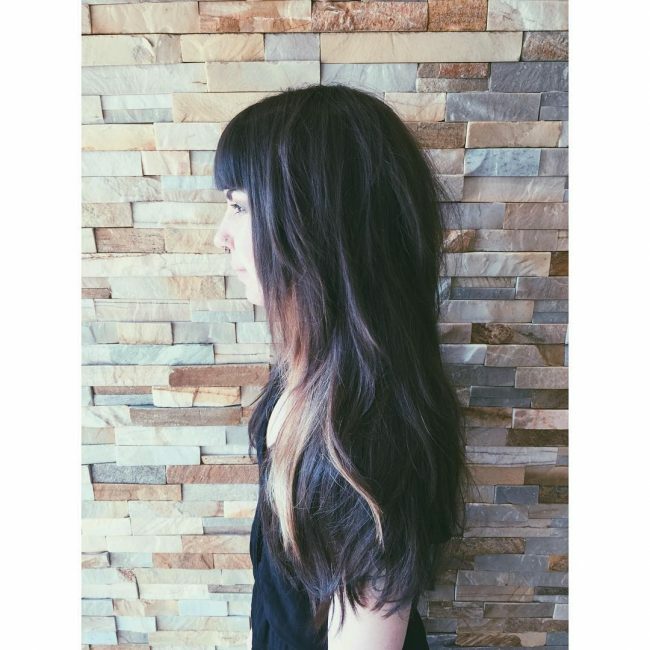 And with such a lovely color pattern these long locks also deserve a perfect cut to complete an exquisite look. 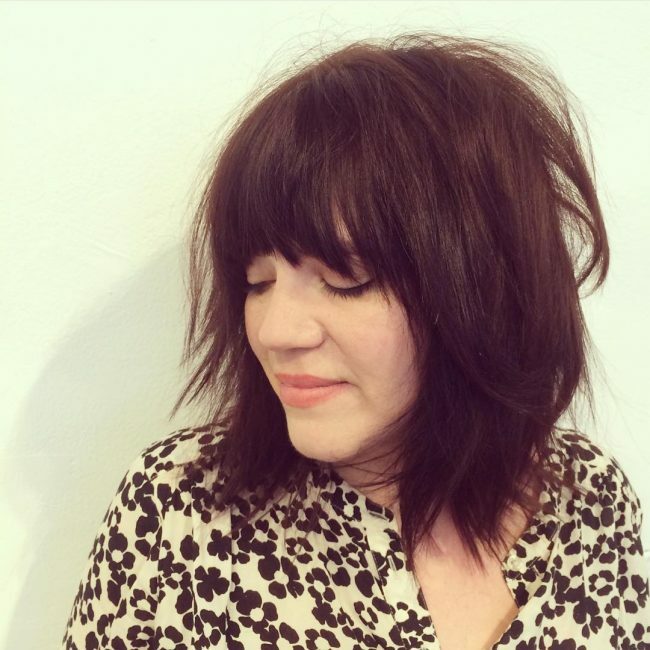 Their cut creates an arched fringe and some wavy locks, and you should style them by stacking. 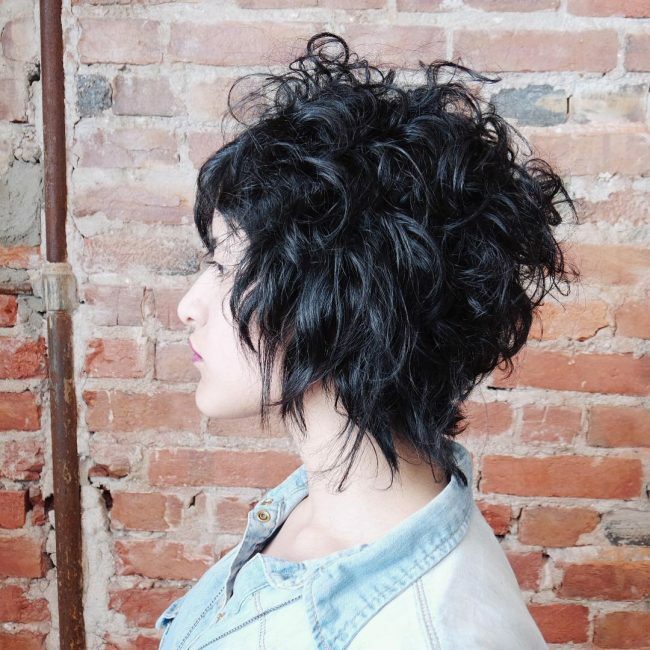 This pixie cut is only a few inches long, but it still looks marvelous. It has some blunt cuts but the texture, and the shaggy styling is what makes it an elegant hairdo. The shag styling and the dark brown hue with shadowed roots also add some beauty to the design. 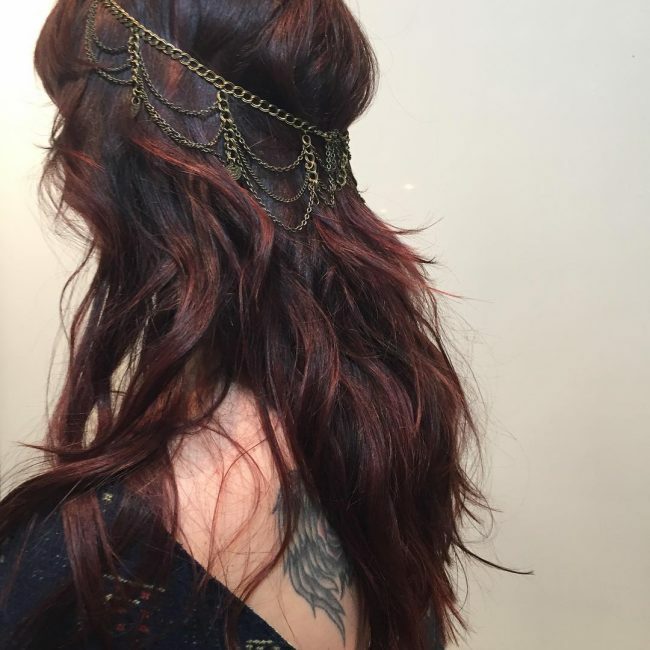 The color of this headdress is fabulous, and it is a blend of red and copper that creates a unique shade. 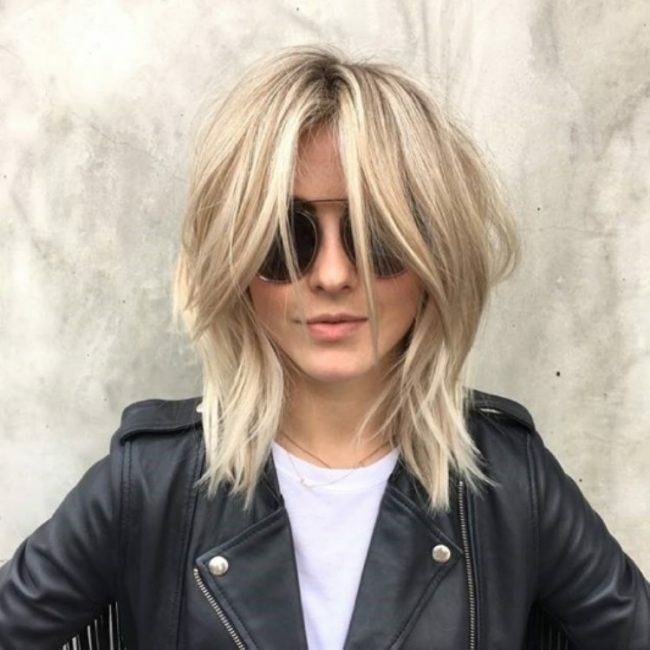 There is still much more to the style than the shade since the strands are also chopped to create some blunt cuts and designed with some slightly messy stacks. 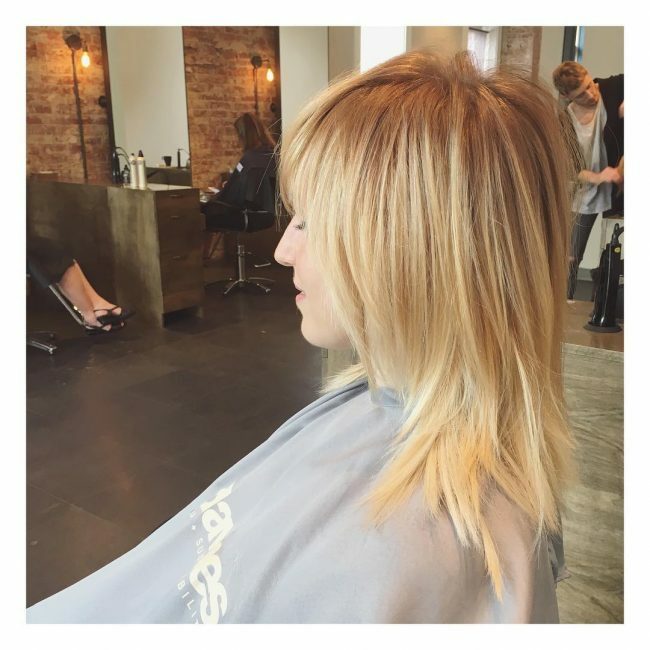 This design starts with a long bob, and so the transformation is wondrous. To wear it you should trim your curly lob to a couple of inches and then style it by making the short curly strands messy. Although you can have it in any color, it looks very delightful in a dark tone. An afro has a very natural look and an amazing texture, and this hairdo takes inspiration from it. 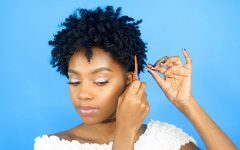 It has the shape and style of an afro but it is not as voluminous, and it is also shaggy, unlike the traditional afro that is typically neatly combed. This delightful style is very straightforward, and its elegant appearance should not mislead you into thinking that it is a sophisticated style. To replicate it you only need to chop your long locks to give them some blunt ends and texture. 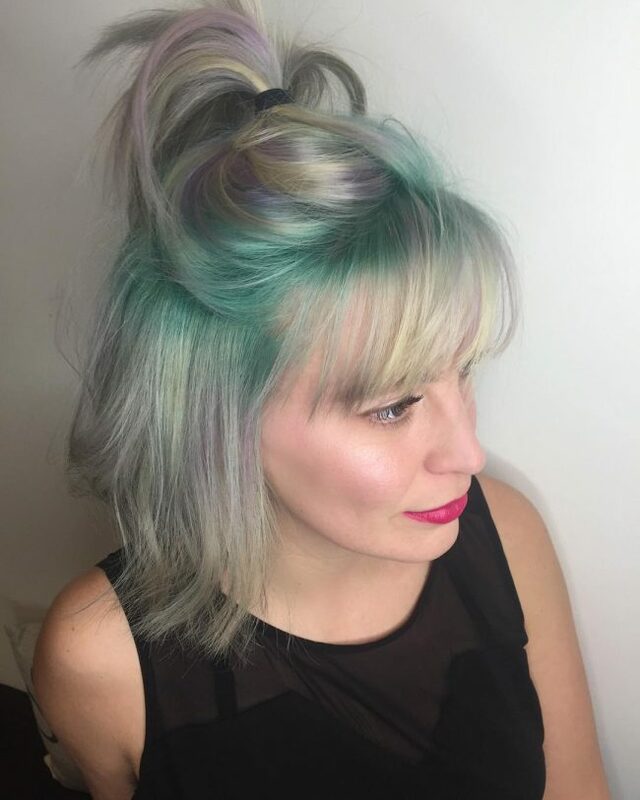 You should also create a fringe and finish the look by giving the strands a highlighted blonde dye job. Some ladies always seem to prefer simple hairdos, and so this one will be perfect for them. Everything about is very simple since it has a medium length size with some neat trims and a slight shaggy layered style. You should then finish it with a center part and by sweeping the strands into a face frame. 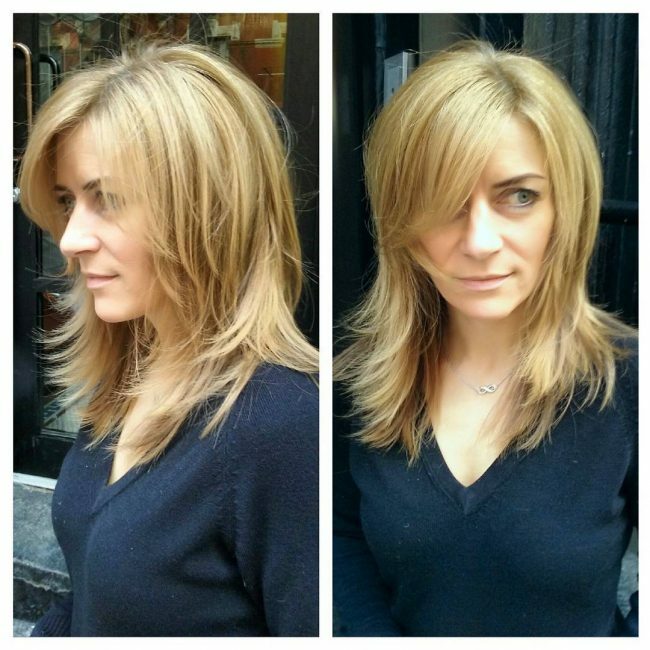 These soft locks have a very dramatic cut, and this is one of the things that make them look fantastic. Since the cut is perfect, you do not need to give them a fancy style since pushing them to the back is enough. However, having the right shade is vital, and a color melt of brown and blonde with shadowed roots will be ideal. 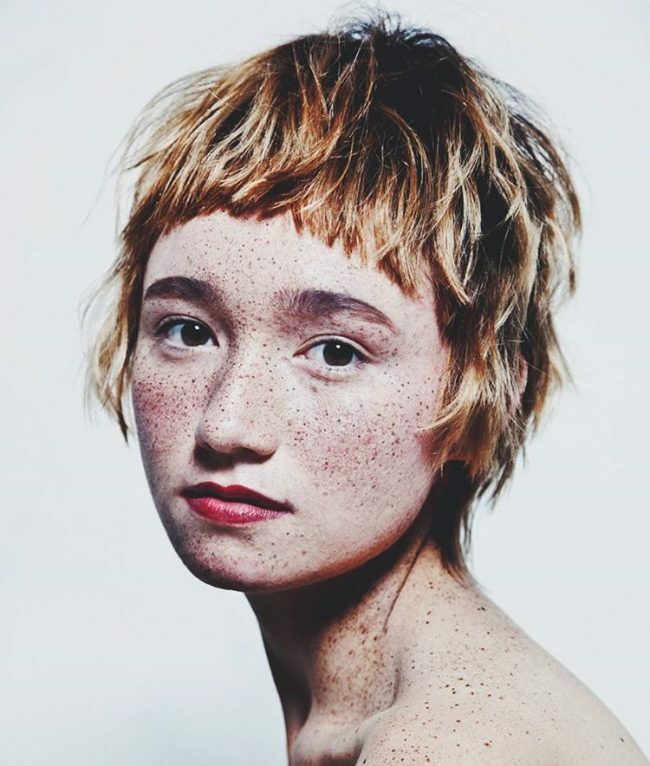 Pixie cuts may be simple hairdos, but the texture and styling of this one make it stand out. Although it is as short as other pixies, it has some cute bangs that make it look longer than it is. 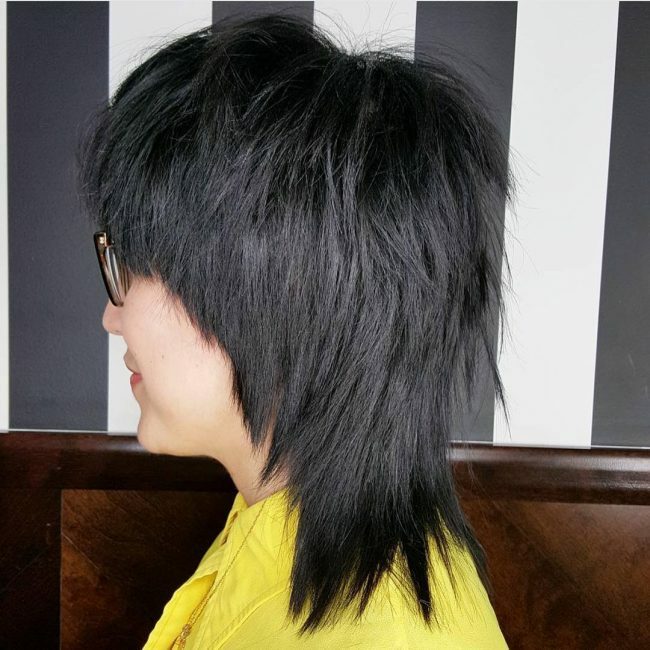 The dark tone is also amazing, but the secret behind this look is to get the cut right, and style with a messy and stacked design. With such an exquisite look you can be sure that you will turn heads since it will make you look very classy. 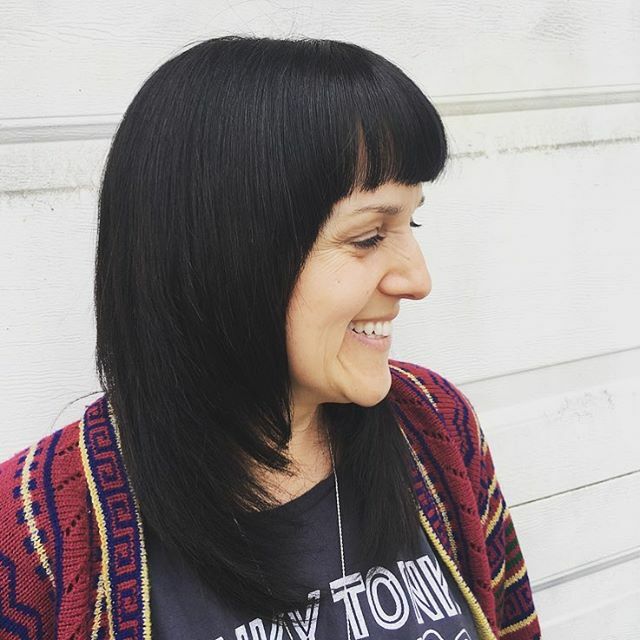 This design entails chopping your locks to create a smooth fringe at the front and giving the long textured locks an asymmetry. You should finish your look by stacking the long locks. The sight of these locks is pleasing, and this is because of their messy natural look. Although they have a cut, it is very moderate to give them some texture, and so all the beauty comes from styling. 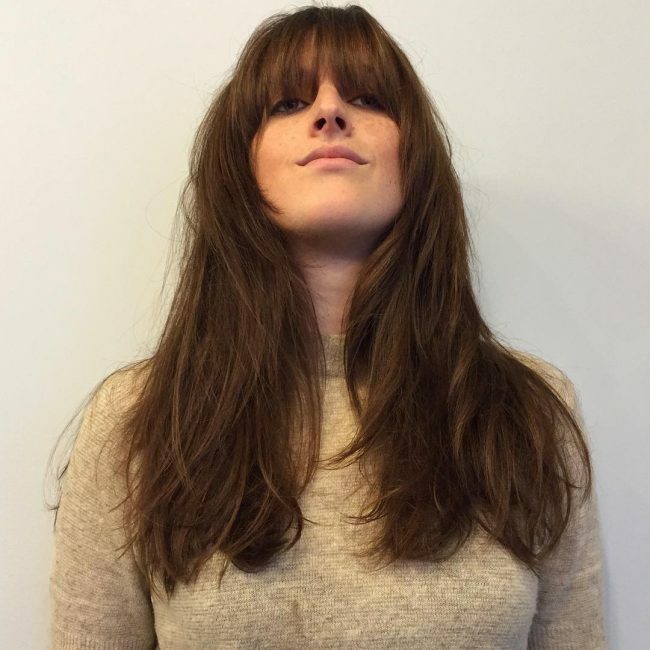 And to create it you should layer your strands in a messy design and create a simple diagonal fringe at the front. One of the best things you can do to your hair is to experiment with new looks. This headdress does this by trimming the strands to create a thin fringe and then coloring them with some rainbow colors. You should then tie a few strands into a knot on the crown and then make the rest shaggy. This style is perfect for a woman who likes to keep bright looks as it has a perfect dazzle. 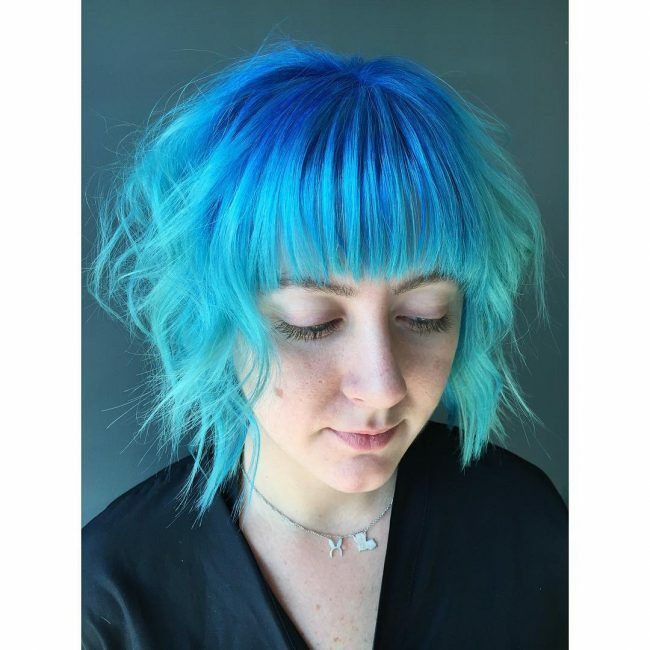 The blue shade is very vibrant, but this style would not look this good without the innovative cut that involves creating some textured locks and a fringe. Some subtle waves on your hairdo will spice up your headdress and also give you some class. The waves are not as messy as you would expect in a shag style but they still create an impressive design, and the warm brown tones help to spice it up. 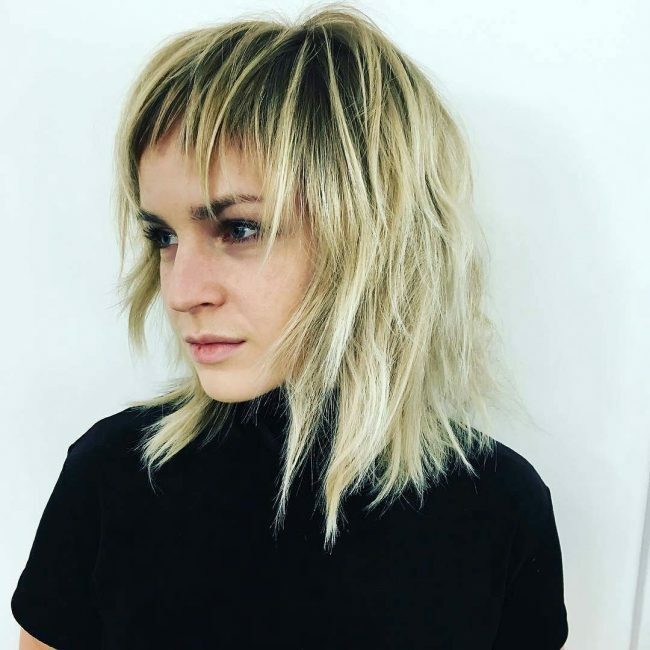 This haircut is very straightforward, and so this is an easy way to create an elegant look for ladies with natural blonde locks. To wear it you need some short cropped bangs with an undercut. You should then create a side part and sweep them sideways to create the design. 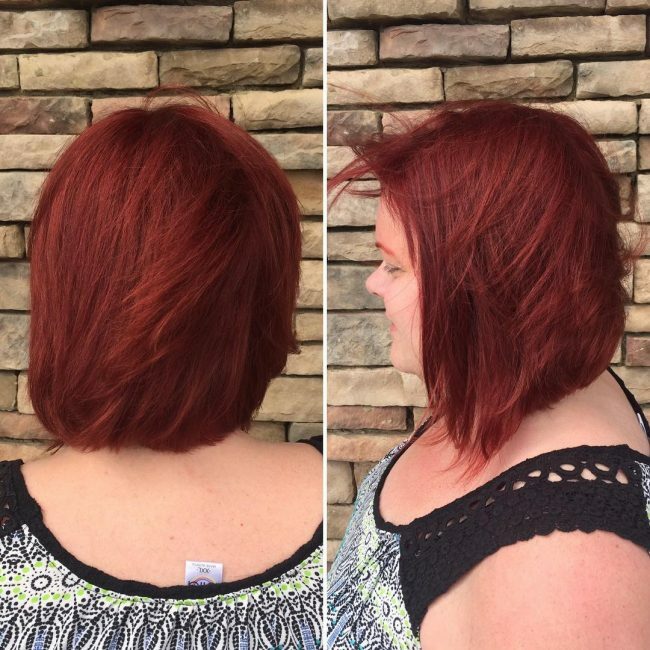 You do not have to chop your strands short since you can still create a long shag cut. To wear one like this you need to razor cut the ends of your long strands and then finish by styling it with a face frame that covers your eyes. Several things may define a top notch headdress but in this particular one, the red shade and the layered style make all the difference. 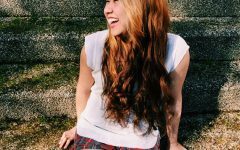 The long locks have medium volume but pushing them back in shaggy layers makes them appear more voluminous than they are. Messy hairdos are lovely but this one looks way much better than most of them, and it also looks very natural. 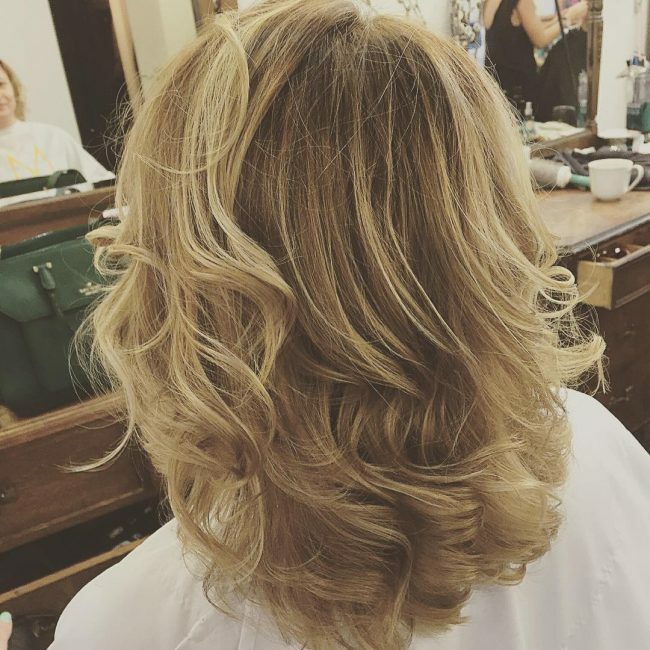 The hairs have some beautiful waves and texture and to replicate this style you should style up the locks at the front and layer the rest in a shaggy design. In this design, the idea is to trim the strands into a V-shape and then style them by leaving them to flow to the back in a messy pattern. 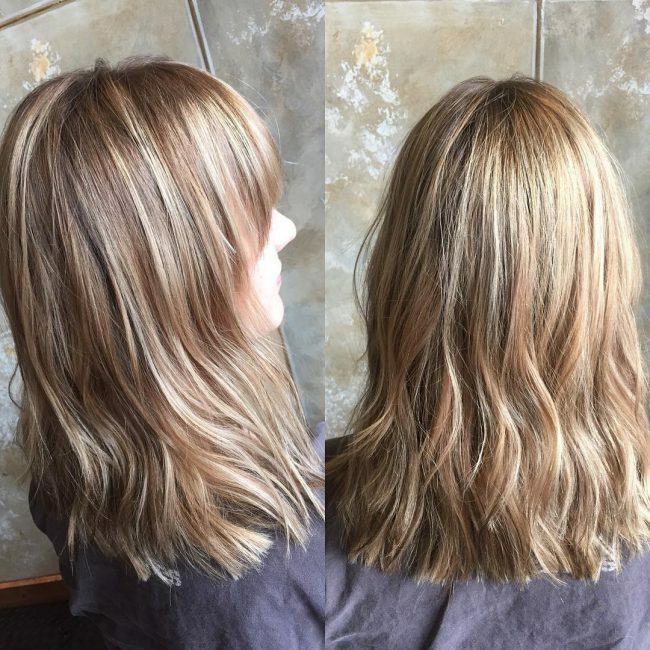 Although they are thin, they have an amazing texture and a lovely brown to blonde ombre dye job that will draw away attention from their thinness. 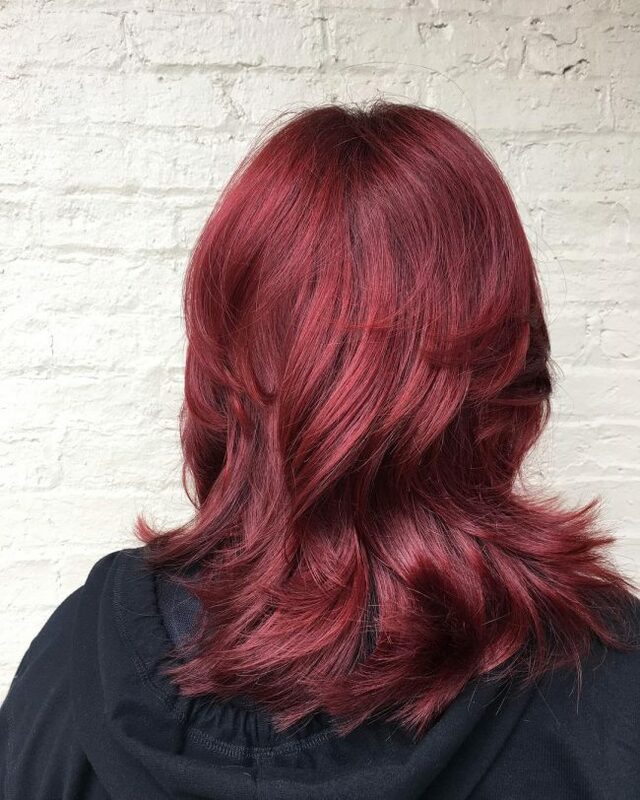 The color transformation from a natural brown shade to this vibrant red shade is fabulous, but the style would not be complete without the trendy blunt cut. Apart from being blunt the cut also has some beautiful bangs that create a smooth fringe on the forehead. Pixies are also quite versatile, and one way to create a unique one is to make it longer than the traditional ones. 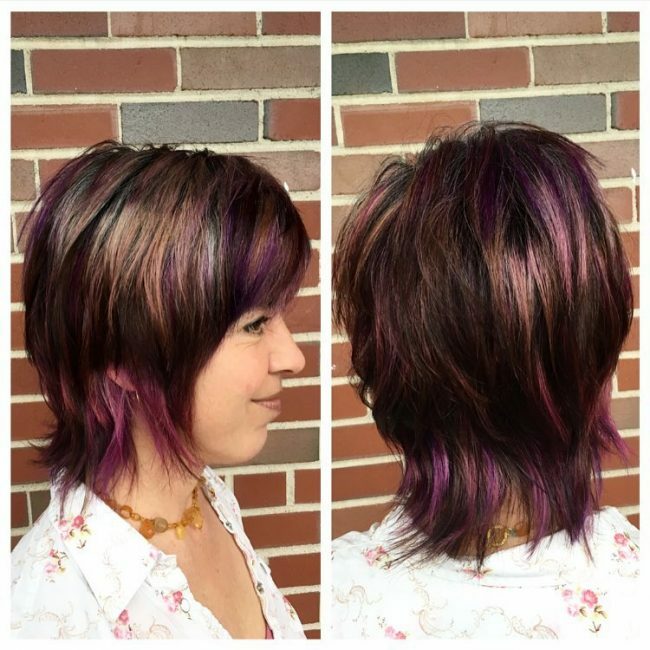 You should also texturize it with some innovative cuts and dye it with purple highlights. And to finish the look you should layer the textured strands to create the shaggy appearance. 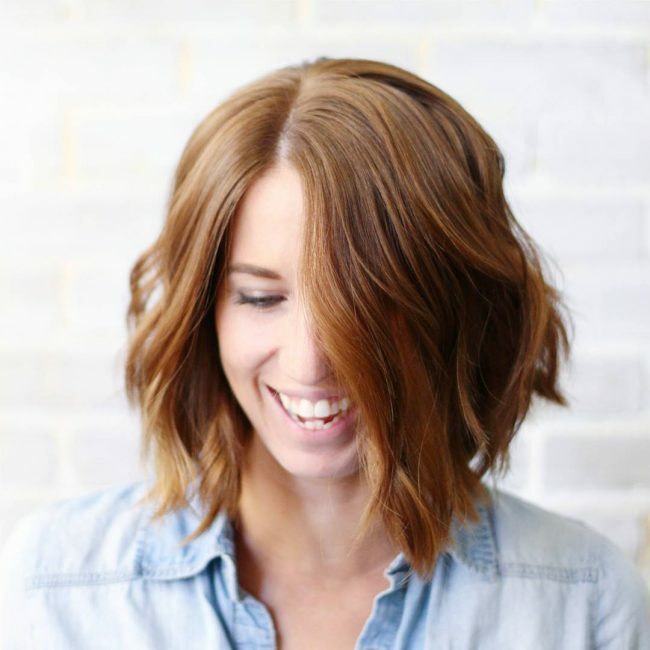 A long bob is a cool hairdo, but you should not just leave it plain and simple if you want to look trendy. 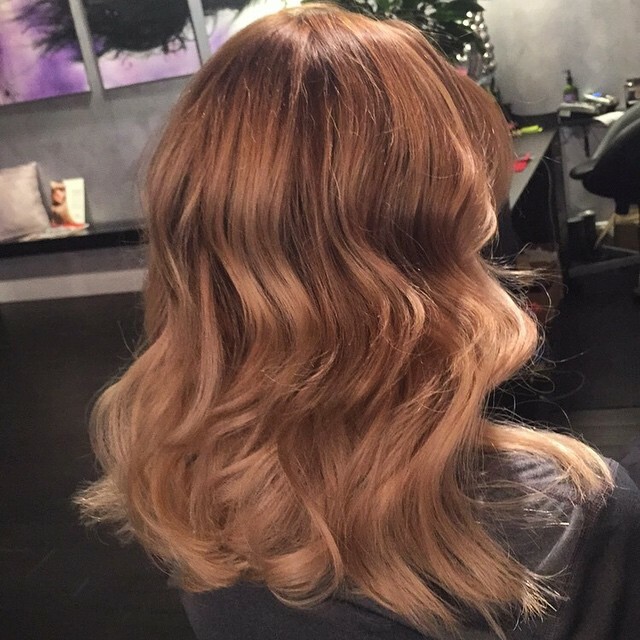 An excellent Sombre color with shades of brown and blonde like in this style is perfect for you. However designing it with shaggy layers will also take the appearance a notch higher. This headdress is a pixie cut, but it looks distinct because the cut is very creative. 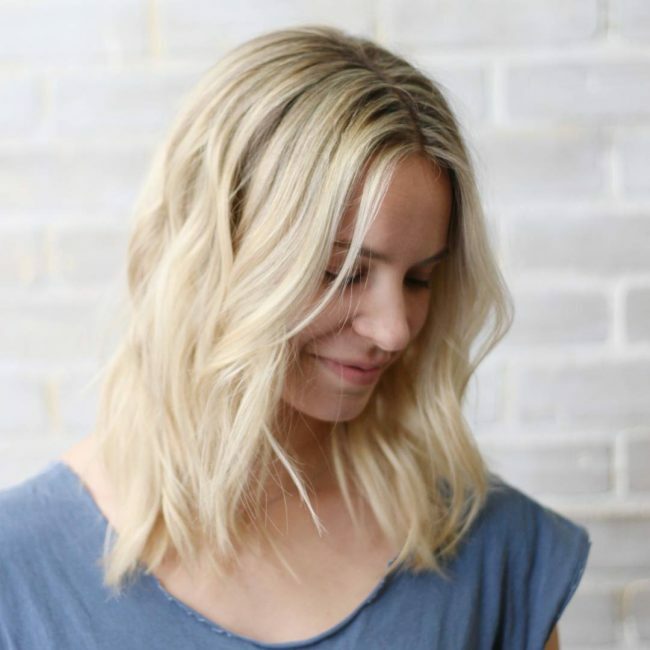 Rather than just chop the strands short you should taper them at the back and sides and then style them by layering with your fingers for a messy natural finish. A mullet may be an old school style, but you can give it a modern touch like in this style to create a trendy headdress. Here the front is not cut short but it is in a bow inspired shape and with some layered bangs to create an impressive shag design. If you want to keep up with modern trends, you have to embrace messy haircuts as they are very trendy. 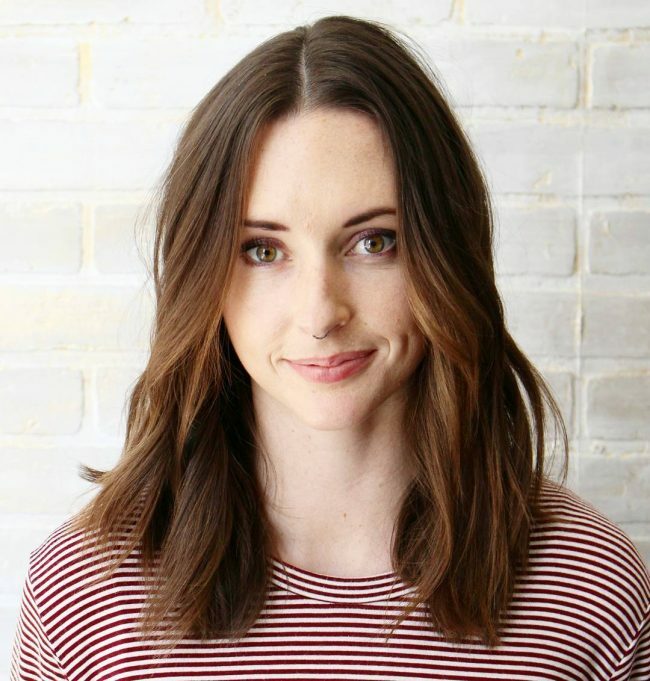 And if you have some shoulder length locks you can create an appealing design by chopping them for some texture and styling with a center part and a messy side sweep. The chocolate hue in this design is incredible, and it makes the long locks look splendid. 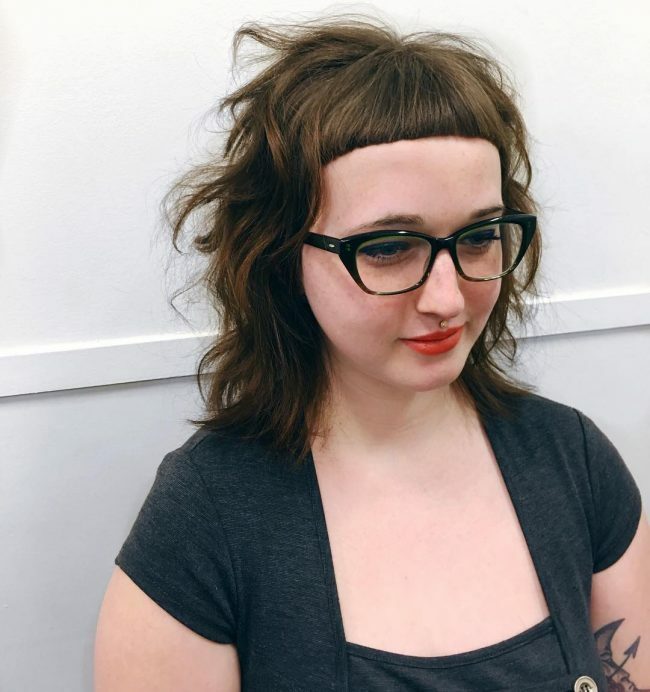 However, they also have some excellent cuts with beautiful bangs that form a fringe on the forehead. You should also style the long locks by stacking them. The center of attraction in this design is the short bang because it is very different from the regular fringe. Apart from being small it also has a neat blunt cut that makes it look like a bowl. The long locks at the back also have an inventive style that involves pushing them back and making them messy. Curls offer you many styling options, and the good thing about them is that you do not have to do much to create an extraordinary hairdo. In this design, all you need is a few trims on the ends and then finish by sweeping them into a messy face frame. 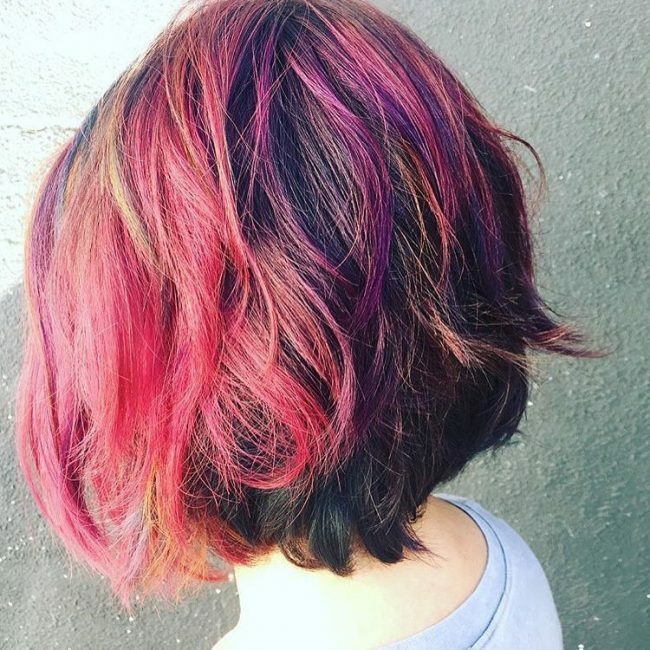 The beauty of this style is in its color and the haircut. 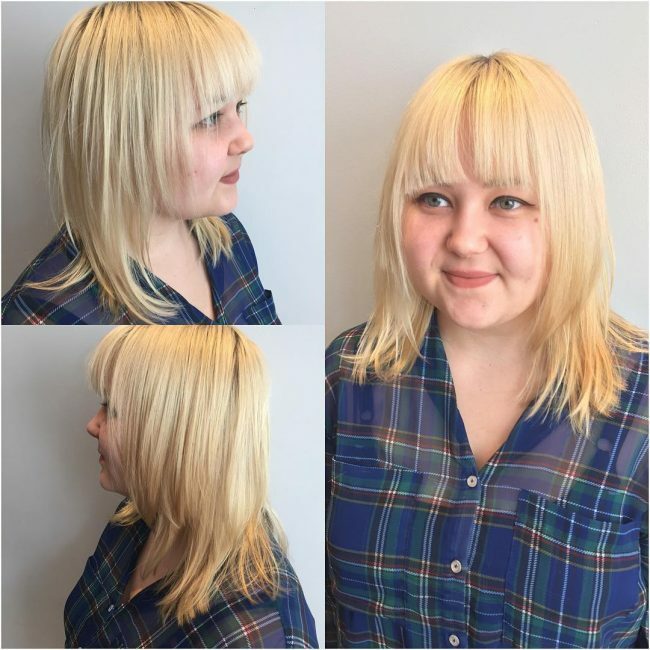 To replicate it you need to chop your smooth and straight strands into an angular bob while leaving a few bangs to create a fringe at the front. The color is a bright shade of green, and so you should not have trouble replicating it. Even a thin hair can still give you a fashionable headdress, and you only need to think of something inventive to do with them. 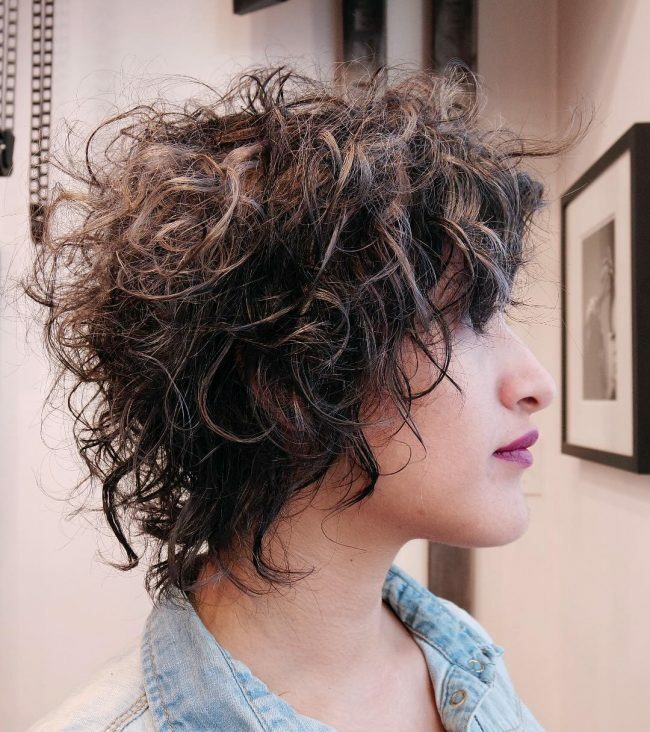 The locks on this design are thin, but they have an amazing choppy cut that gives then some texture, and you should style them by stacking so that they appear voluminous. 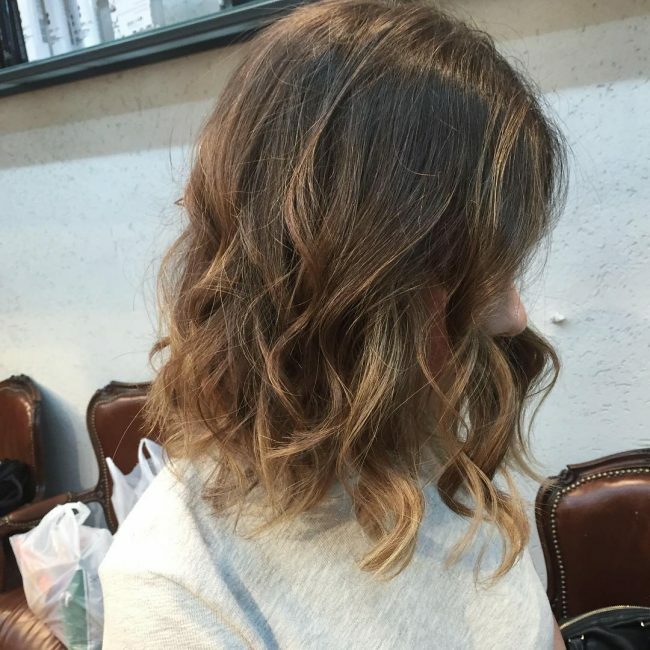 Apart from the cut they also have some rich brown balayage hues that give them a perfect tone. Shag haircuts do not have to look unkempt or rugged because you can still make your locks neat and maintain the shaggy appearance. This hairdo is a perfect example of a neat one, and it comes with long choppy blonde locks with darkened roots. And you should style them with a center part and by sweeping the locks to the side. This flirty platinum may not be as messy as other conventional designs, but it still maintains an impressive appearance. The fine locks should have some nice cuts that give them an amazing texture and also create some lovely bangs. You should then hand-paint a platinum shade and style by stacking your strands from a center part. Everything about this style is perfect, and this is what makes it a top notch headdress. The shoulder length locks have a fantastic texture and volume, but their style is what makes this an outstanding look. 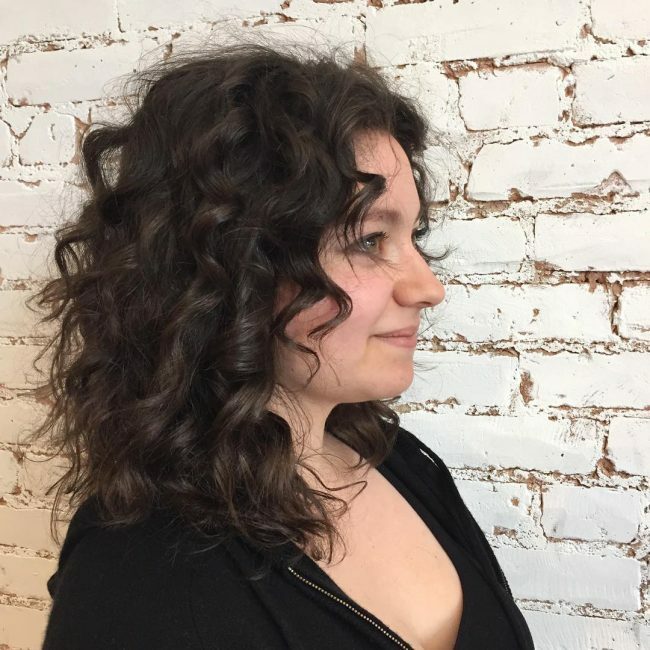 To replicate it you should give your textured strands a center part and push them sideways to show off the messy waves and to expose the darkened roots. 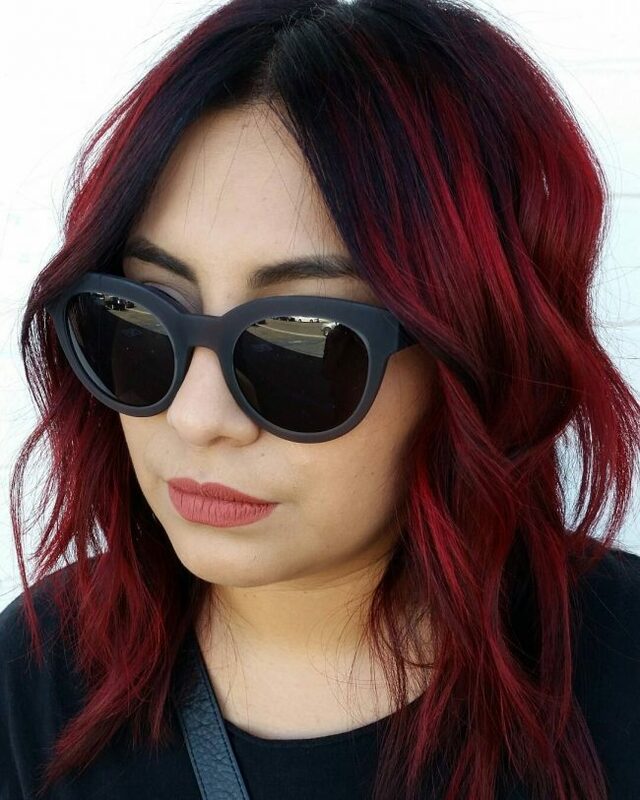 The fierce and rebellious look of a shag cut is head turning, but you can always take it a notch higher with a lovely red tone like in this design. Here the strands also have some dark roots, and this helps to create some contrast with the red tone. The subtle waves and the center part in the style also add to its beauty. 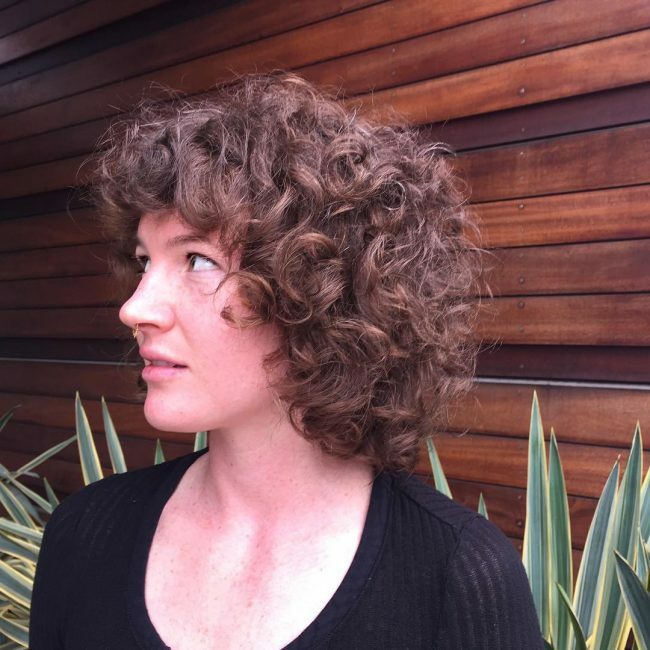 Your natural curls can also give you an extraordinary hairdo if you know how to design them. In fact, you only need a little creativity like in this style. 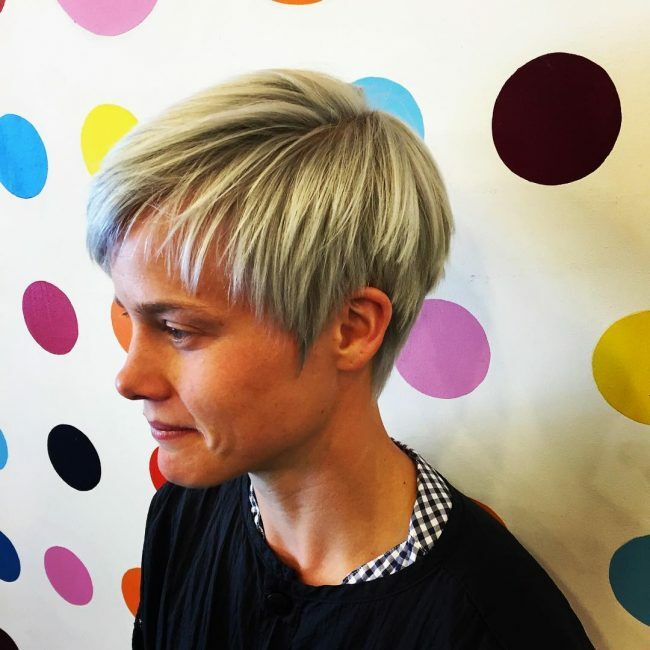 All it takes to create this elegant style is trimming the curls short, giving them a hint of silver gray and then finishing by making them shaggy. Contrary to how this style appears it is very easy to create. 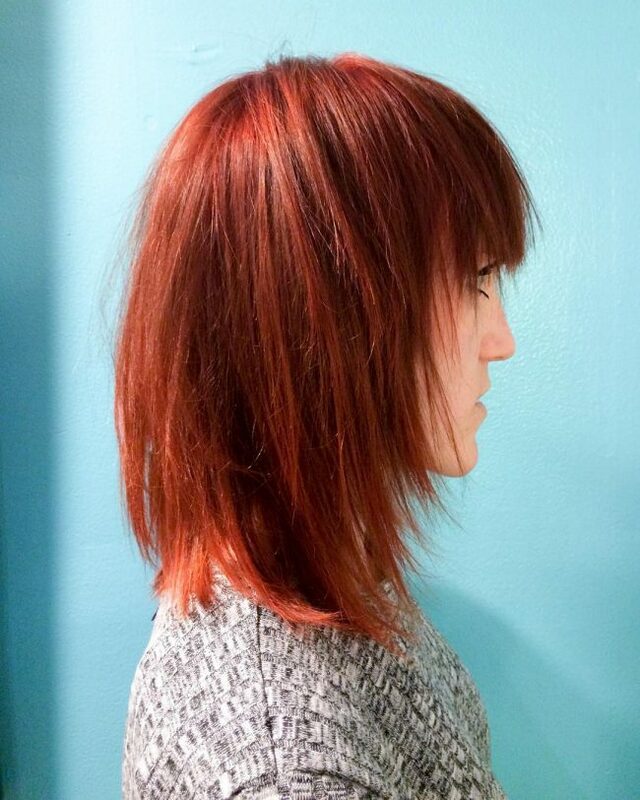 It is typically a long shag with some blunt cuts on the ends, and it has a lovely red tone. You should style it with a part and then leave the locks to flow freely to finish your style. Face framing layers may be a typical headdress but you can still make yours look unique. 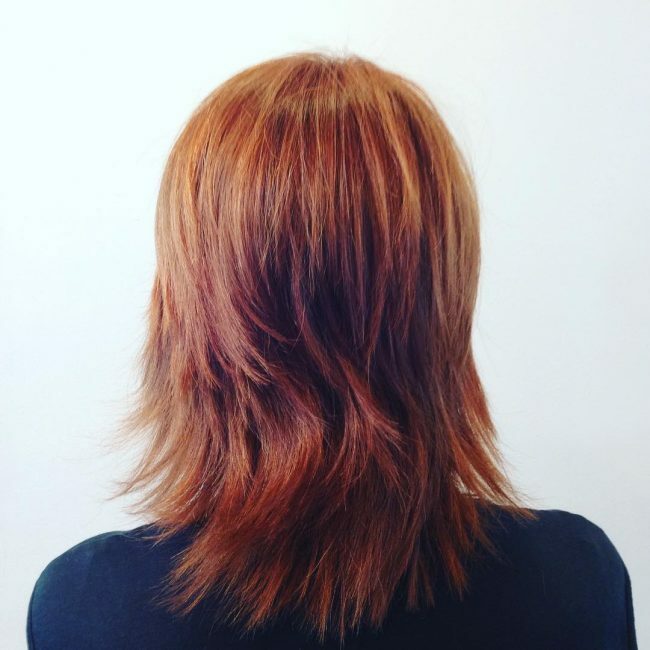 In this design, the rough cut, the layering from a side part and the golden blonde hue are what make it unique. Apart from this, it also has a slightly messy look that also spices up the look. 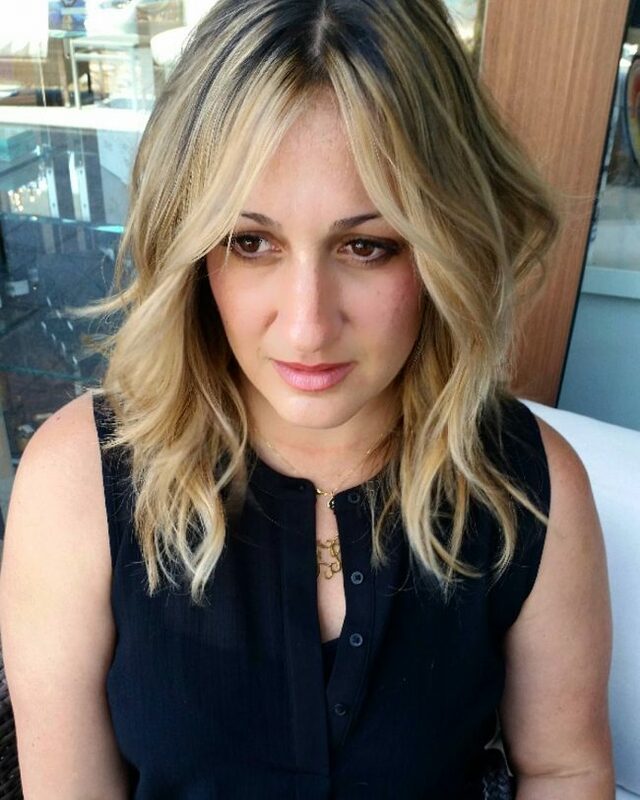 This long bob accentuates the oval face nicely and gives it a perfect symmetry. It has a lovely brown shade, but the cut and center part are what makes it stand out. The haircut involves chopping the locks for some texture and you should then style with a center part. 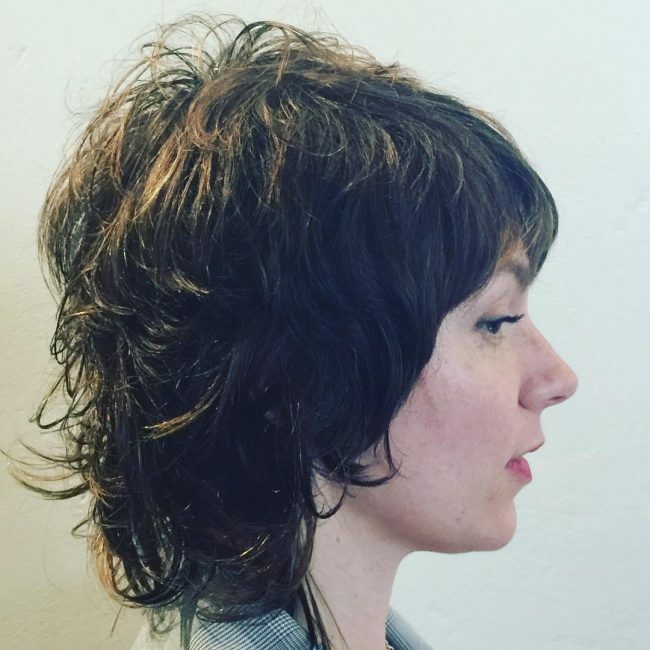 You can take inspiration from an old-school haircut to create a trendy shag cut and this one of is inspired by 80's hairdos. 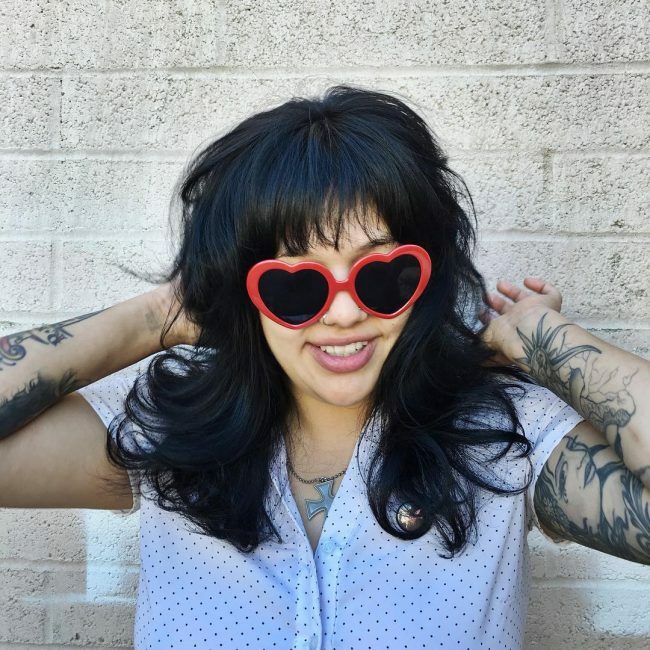 It has some long, voluminous locks that you should style into an Emo like fringe and leave some long shaggy locks to flow freely. The best thing about modern headdresses is that you can create a fashionable look even with only a couple of inches of fine strands like these. 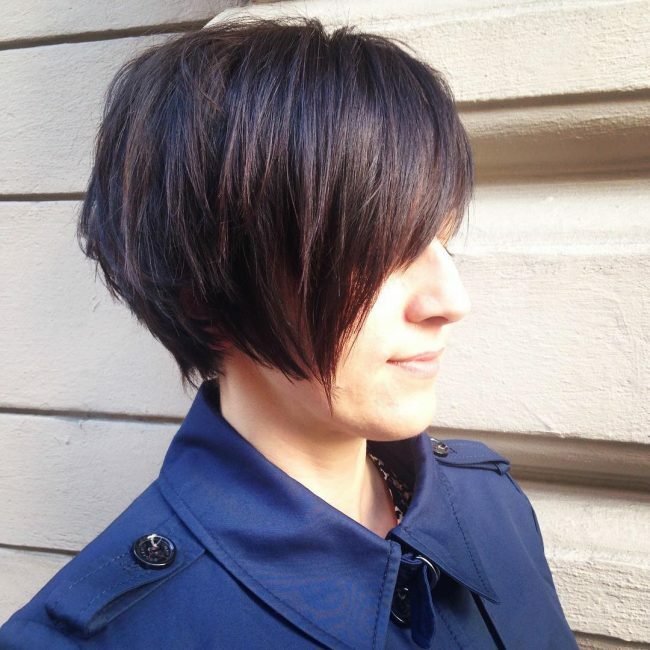 Here the strands are cropped into an angular and edgy bob, and you should style them by layering to create a shag look. This headdress is very natural and it has minimal cuts, and this is what makes it look outstanding. The brunette strands only need a simple layered push back and a stylish headband to make them look exquisite. You should also make them shaggy for a natural finish. The natural and rebellious look of a shag cut makes it perfect for most ladies, and it is very suitable for the outdoors. It is also very easy to create, and you can have it with any hair type. The above 60 styles will give you different ideas on how you can wear this trendy look.